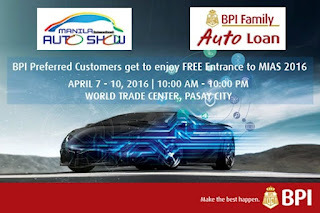 BPI Family Savings Bank, the country’s leader in auto financing, is once again the co-presenter of the Manila International Auto Show (MIAS) which is slated this weekend, April 7 to 10, at the World Trade Center in Pasay City. And if you’re a BPI preferred client, you can get free entrance. If you’re a holder of a BPI Gold Debit Card, you can score free entrance to MIAS by simply flashing your card along with one valid ID at the ticket booth. Each BPI preferred customer is entitled to only one complimentary ticket during the duration of MIAS. Aside from free entrance to its preferred clients, BPI Family will also be raffling off prizes such as Go Pro Hero cameras, Petron e-fuel cards, and GPS devices. Of course, BPI Family will also offer on-site auto loan applications during the entire duration of MIAS making it easier for you to drive home your dream car this summer. You can also go online to their website to find out if you’re pre-qualified. All it takes is just 60 seconds.